Everton’s increasingly turbulent season sees us run into Ian Holloway’s Blackpool this Saturday in what will be an interesting tactical battle of 2 contrasting formations. Blackpool will line up in their usual 4-3-3 system with the impressive DJ Campbell as the central striker flanked by Luke Varney on the left who will look to provide width with Gary Taylor Fletcher on the right side cutting inside at every opportunity. James Beattie is in contention and as inept as he is as a striker you wouldn’t be surprised if he came back to haunt us. In midfield, former Crewe man David Vaughan will anchor things and the Welshman is something of an unsung hero in comparison to the talismanic Charlie Adam who plays ahead of him. Vaughan is really impressive in possession with a quality left foot and as a convert from full back is great in the tackle with a success rate of 75% (only Scott Parker making more successful tackles than him this season). New signing Andy Reid will be deployed as the closest creative support to the forward three having taken the impressive Grandin’s role in the previous match. After shoring up an initially leaky defence the Tangerines have dipped again of late, conceding 11 goals in their last 4 outings with only WBA having conceded more goals this campaign. An interesting dual will see former Blue trainee David Carney aiming to stop one of our key men, young Seamus Coleman who of course played on loan at Blackpool last season. I would expect us to try and attack t he space caused by Blackpool’s lack of width in midfield by getting the ball out to the flanks as quickly as possible . 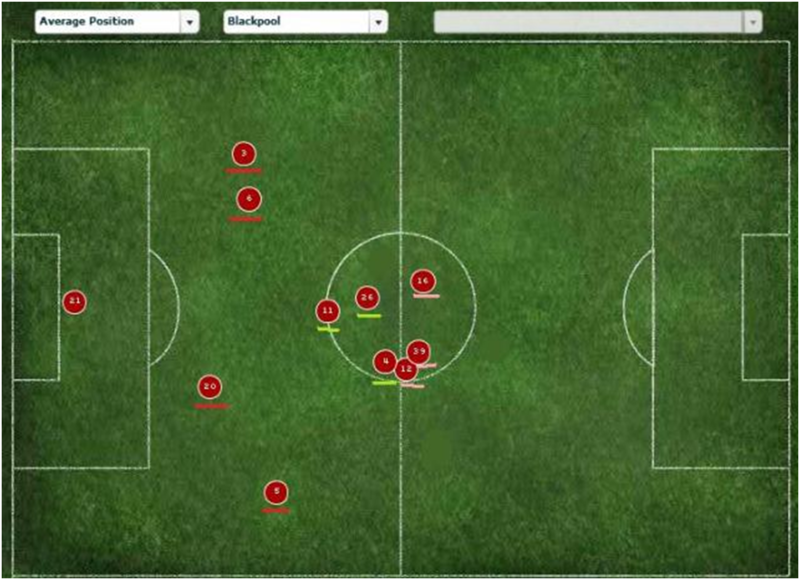 Seamus Coleman and Steven Pienaar did well in exploiting these areas in the corresponding fixture earlier this season. 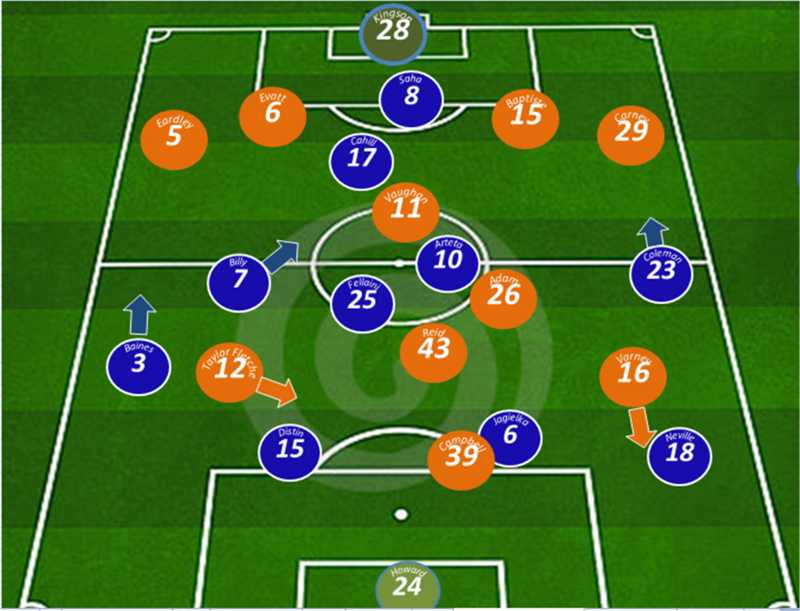 The below diagram of Blackpool players average positions on that day translates this nicely. Tim Cahill is likely to come back, probably at the expense of Jack Rodwell ,and will play up top with Saha when the Blues are in possession, dropping back into midfield when Blackpool are on the ball. Billy and Seamus Coleman will provide outlets on the flanks. Much will rest on the shoulders of Fellaini and Saha, who have both been putting in great shifts for the team in recent weeks. Arteta was also showing signs against Arsenal in the first half that he could be finally ready to hit some form. Phil Jagielka should return to defence and if so he will need to be on his game as Blackpool offensively will cause us many problems . They have shown all season they are a potent outfit and will be buoyed by our miserable defensive record of 1 clean sheet in 16 games. This is a game Everton dare not lose with the relegation zone getting closer with every game. The Tangerines are no mug outfit though and have taken more points on their travels than the Blues have at Goodison this campaign. I think this will be a good game to watch, plenty of goals and most probably a draw! I’m going for a repeat of the Bloomfield result earlier this season – 2-2.